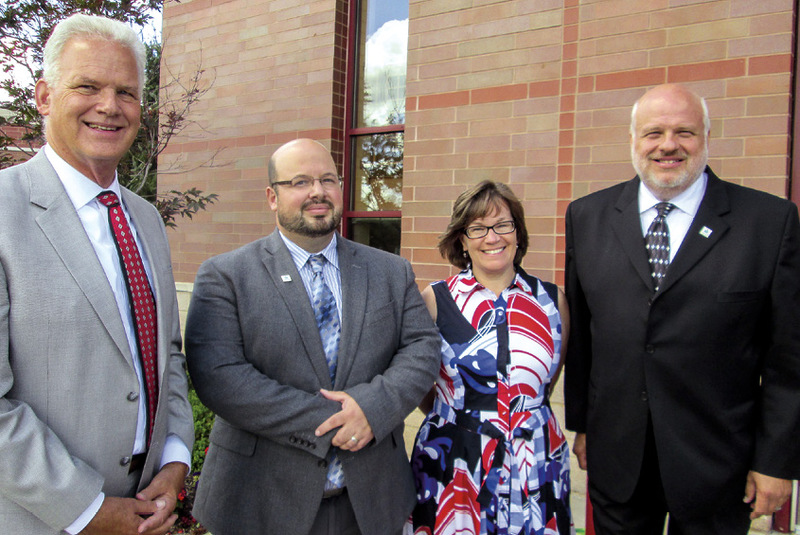 Four principals joined the schools of the Syracuse Diocese at the start of the 2016-2017 school year. Pictured, left to right, are James Fountaine, St. John the Evangelist School; Matthew Martinkovic, Seton Catholic Central Jr./Sr. High School; Susan Kitchen, St. James Elementary School; and Brian Nolan, Bishop Grimes Jr./Sr. High School. With one semester under their belts, four new principals have settled in to their respective leadership roles in schools throughout the diocese. Each has taken on the joys and challenges of leading students, faculty and staff in environments with a strong emphasis on academics, character and faith. Fountaine is the principal at St. John the Evangelist School in Binghamton. A graduate of Catholic Central High School, he earned a bachelor’s degree in elementary education from St. Bonaventure University and a master’s degree in education and administrative certification from SUNY Cortland. Before joining the diocesan schools, Fountaine was a teacher and administrator in the Union-Endicott School District from 1973 to 2010, during which he served as principal at two of the elementary schools. He is a very active member of his parish, Our Lady of Good Counsel in Endicott. Kitchen is the principal at St. James Elementary School in Johnson City. She began her career as a teacher at Our Lady of Sorrows School in Vestal. Originally from Rochester, where she attended Catholic elementary school, Kitchen earned an associate’s degree in early childhood education at SUNY Broome, a bachelor’s degree in elementary education from SUNY Oneonta and a master’s degree in education from SUNY Cortland. During her career, she also served as a teacher and Enrichment Program coordinator for the Binghamton City School District. Martinkovic is the principal at Seton Catholic Central Junior/Senior High School in Binghamton. A graduate of Seton, Martinkovic is certified by New York State as a school district administrator and a secondary science teacher. He earned bachelor’s and master’s degrees in teaching from SUNY Cortland and completed his certification in school building leader-ship at Le Moyne College. Martinkovic previously served as principal of St. James Elementary School in Johnson City and has taught at several Catholic schools throughout Broome County, including St. Joseph’s School, All Saints School and St. James. Nolan is the principal at Bishop Grimes, Junior/Senior High School in E. Syracuse after 31 years in the Syracuse City School District. Prior to joining Bishop Grimes, Nolan was most recently the executive director of high schools and career technical education for the SCSD. He also served as the principal at Corcoran High School from 2002 to 2008 and vice principal of Fowler High School from 1999 to 2002. He previously taught special education, as well as coached basketball and football. Nolan is a graduate of St. Brigid & St. Joseph Grammar School and is currently a parishioner at that parish. He earned his bachelor’s and master’s degrees in special education from Syracuse University and his certificate in advanced study in educational administration from SUNY Oswego.